I've been working on something. But you can't see all of it. Yet. I can, however, show you these super-cropped close-ups to tickle your fancy. 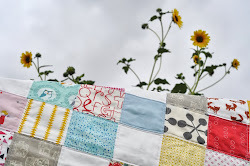 It involves patchwork, starring bits and pieces of the vintage calendar tea towels that either you can't believe I've cut up, or you can't wait to see cut up more. 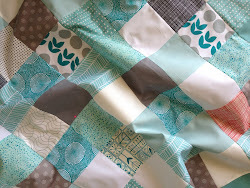 It involves my first attempt at free-motion quilting. Which, if you've never tried it, can best be described as the techno music of sewing. It's jerky, it's loud (if, like me, you haven't oiled your sewing machine), it's stressful -- but if you give in, it's kind of fun, in a let-loose sort of way. And, of course, it involves red. Here, there, and, for fun, in the binding, too. I love your recent blog changes, it's inspiring - nice work. this looks a little blue blue completely blue! loving the 'seagals' as we'd call em at our place! You're a tease! What we can see... looks great!